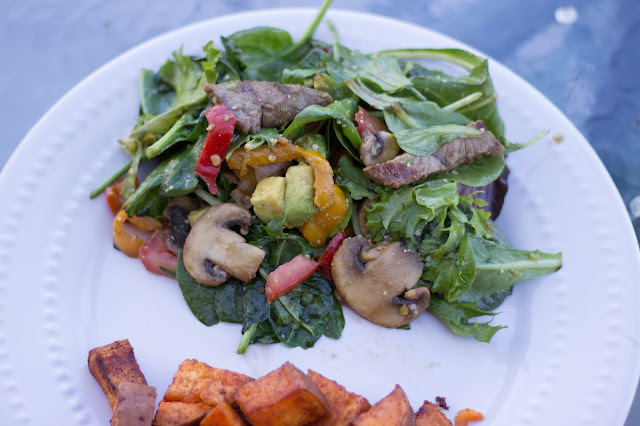 Tasty Tuesday: Balsamic Steak Salad | For the Joy of Life. I never say "can't even" but... if there was the perfect time to say it, it would be right now haha. In a matter of 48 hours we've dealt with replacing 3 tires, a cranky toddler, a flood in our home (and on the carpet, ugh), a plumber that came like 4 hours late, a lost debit card, an even crankier toddler, a found debit card because the Sonic lady forgot to give it back to me, and a sassy Sonic employee that thought it was my fault... HA! Guys, I'm so ready for this week to be over already! My saint of a husband however, knew I was a little more than frustrated over the whole ordeal, and brought home pizza and I thought I was gonna cry it made me so happy haha! On to the real reason why you came to this post! I don't really like my bread dipped in balsamic... but when it comes to asparagus and salads, I want all the balsamic! So, I made this little Balsamic steak salad based off cravings and Hunter literally had 5 bowls of it! 1) Grill your steak with some garlic salt and pepper until cooked to your liking. 2) In the meantime, sauté your bell pepper, mushrooms, and onion with a little olive oil, salt, and pepper. Cook until al dente. No soggy veggies here! 3) Wash your salad mix and pat dry. Stick in a large bowl. Add in your cut up tomatoes and avocado. 4) Once everything is done cooking and slightly cooled add it to the salad mix and lightly toss with Balsamic vinegar, olive oil, and salt and pepper. I don't have exact measurements here because it's totally up to you how strong you want the balsamic taste to be. I would say I did 5-6 tbsp of balsamic to 3 tbsp olive oil give or take. Remember that you can always add more but you can't take it away! 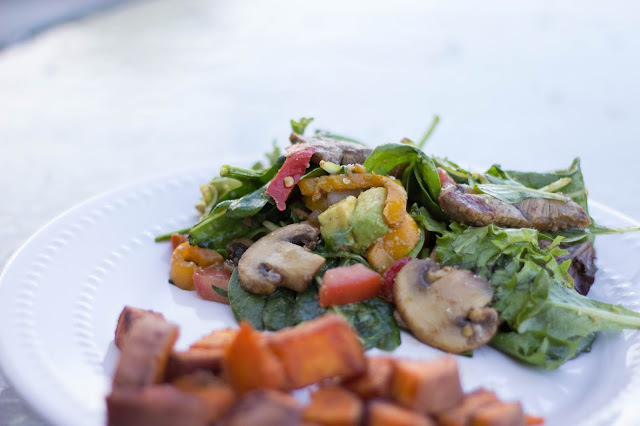 5) I added a little parmesan on top and served with roasted sweet potato! 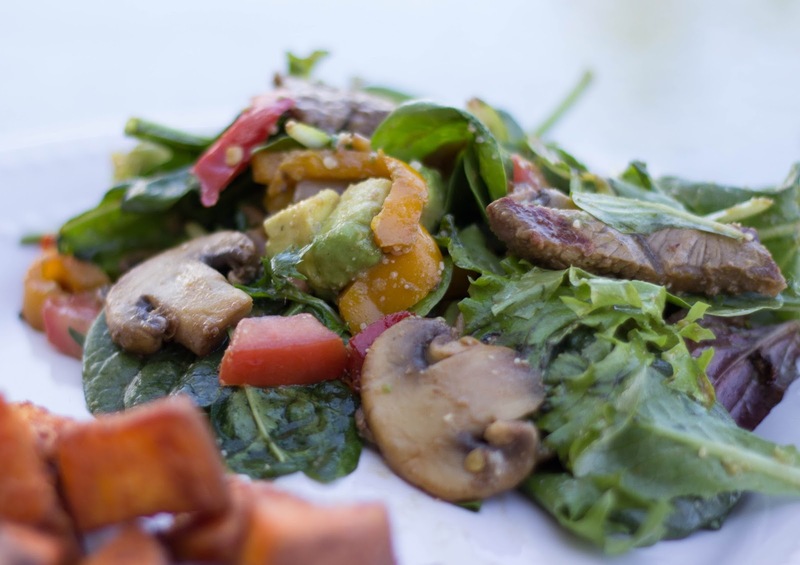 Every now and then, a good salad for dinner is just needed! I can't wait to make this all the time this summer!